After the True-Life Adventure series ended, Walt Disney continued to make animal films that had a script instead of "letting nature tell the story." This film is based on a collection of stories by Ernest Thompson Seton, one of the founding members of the Boy Scouts of America. Similar to Niki, Wild Dog of the North, a narrator is used to explain the action on screen. The film was shot entirely on location in Sedona, AZ. James Algar, animation director turned live action producer for most of Disney's nature films, co-wrote and co-directed this film. The other writer, Dwight Hauser, had previously worked for the studio as a writer on the People & Places and True-Life Adventure films. The other director, Jack Couffer, had a very similar background directing many of the True-Life Adventure films. Disney legend Rex Allen provides the narration, with help from the singing group The Sons of the Pioneer. They wrote most of the songs in the film, except for the title song which was done by the Sherman Brothers. This was Rex's first narration of many Disney films. The opening credits play against footage of a wolf running. 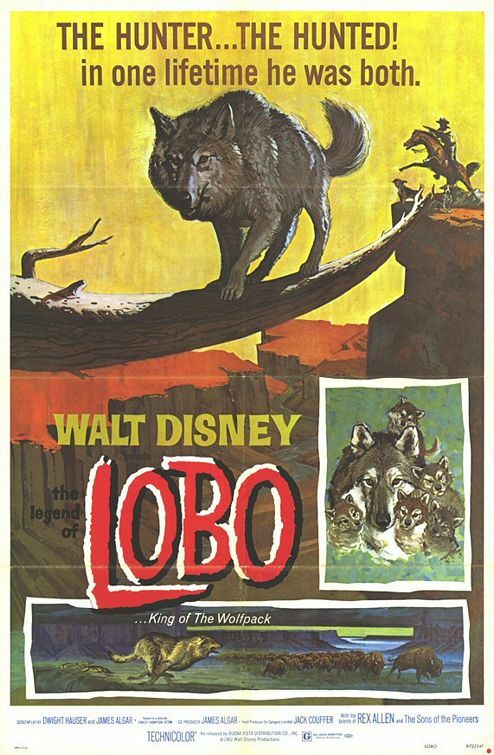 As many wolves begin to howl, Rex Allen starts to sing "The Legend of Lobo" as we learn that Lobo is a wanted wolf who is a menace to the citizens nearby. The story is told in flashback as we are introduced to young Lobo and his family. His father, Elfaro, has a hard time hunting because they live in somewhat of a wasteland. When Elfaro decides to relocate the family after seeing hunters in the area, Lobo gets lost and has to fend for himself. He is reunited with his family when confronted by a rattle snake. Lobo's mother gets killed by hunters and Alfaro ends up in a hunter's trap. Lobo stays with him to keep watch, but has to leave when the hunters return to the scene. He joins another pack and finds a mate, but the pack leader doesn't approve so the two wolves leave the pack. They make a home out of an old Indian dwelling. Shortly after, his mate has puppies. Lobo angers the cattle men because he almost exclusively hunts their cattle. This prompts wanted posters to be put up with reward money for his capture. Lobo's mate ends up in a hunters trap and is used as bait to catch him. Lobo is able to free her and his new family ventures off in search of a new home. 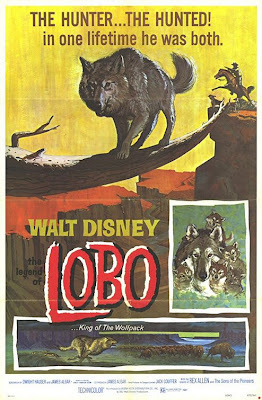 The Legend of Lobo was released on November 7th, 1962. Critics generally felt that while the narration was outstanding, the visuals on the screen didn't match the excitement. I was unable to find box office financial data for this film, but I'm assuming it made money since this format didn't stop here. Possibly due to its run time (too short to be split into two episodes, too long to be just one), it was never aired as part of the Disney Sunday night program. It made its home video debut in 1985. I never got to experience this film as a kid, but if I did I probably wouldn't have sat through the whole thing. While the beginning is fairly adorable when Lobo is a puppy and there is quite a bit of excitement towards the end, the middle gets very slow and it can easily lose any viewers attention. I disagree with the critics about the action on screen not representing the narrative. I thought it was well filmed and several scenes were expertly done. In general, I'm not a big fan of narrated animal movies and Disney certainly did a better job with its previous effort, Nikki, Wild Dog of the North. Of the two films, that is the one I would personally recommend. The Legend of Lobo is currently available on DVD as a Disney Movie Club Exclusive. The film is presented in fullscreen, although it was originally shown in a widescreen aspect ratio, most likely 1.75:1 (Disney's most common ratio for this era). There appears to have been a minor restoration and the film looks pretty good. There are no bonus features. It is also available on iTunes where it is also presented in fullscreen, but with the option of buying in HD.